A bathroom redesign gives you the opportunity to add luxurious features that improve the comfort, visual appeal and practical usability of your bathroom space. Here are three of the more luxurious extras you can incorporate into your bathroom redesign. Radiant heating in the bathroom offers an improvement in physical comfort that other types of heating can’t match. A radiant heating pad under the surface of the bathroom floor generates heat that rises and warms the room from the bottom up. The floors are warm, which means no more jolts from stepping out of a hot shower onto a cold floor. Radiant heating can be more effective than a forced air system, as the heat from the floor warms occupants from the feet upward, allowing more heating to contact their bodies. A hot bath in a soaking tub is a luxurious way to enjoy the comforting environment of a quiet, calming bathroom. 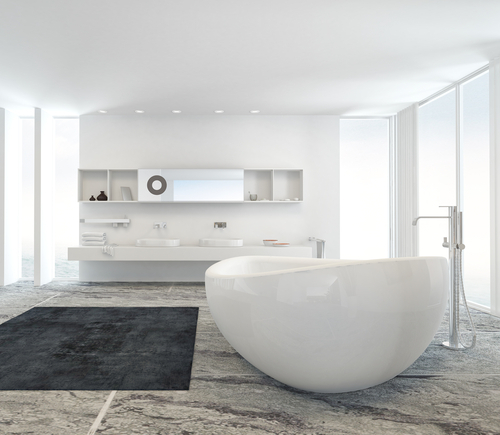 A soaking tub creates a space where individuals can take a slow, luxurious bath while enjoying the meditative comfort of a bathtub. A double vanity increases the available space for activities such as hand washing, shaving, applying makeup and brushing teeth. Two vanity sinks allow more than one person to use the vanity area at a time, and the larger surface permits extra storage of personal care items or other important material. A large mirror backing the vanity not only provides plenty of reflective area, but it also helps the entire bathroom space look larger and more spacious. For more information on how to add both visual and physical luxury to your bathroom redesign, contact Newton, MA general contractors Sage Builders LLC. Our team of professionals provides expert residential design/build, renovation and consulting services.